Our Universal home cinema seating offers the ultimate in comfort and functionality with not only stylish contemporary cinema seating but with all the controls for the chairs built into each cup holder. The cup holder is black ceramic with inductive touch sensitive controls. Available to view at our showroom or do a using Facetime, Whats App or many more video calling apps. Frame: solid wood and plywood, glued screwed and re-enforced at all structural areas - Free 10 Year Guarantee. Feet: Solid wood with dark wood stain finish. Base upholstery: Full Zig Zag metal sprung upholstery with high quality reflex foam and premium leather finish. A top grain leather sofa is a great choice if you want a hard wearing, durable and easy to clean sofa. It makes an ideal choice for a busy family home with young children and pets. A great feature of this leather is that if liquid, such as coffee, is spilt onto your sofa the pigmented coating will resist absorption long enough for you to be able to wipe it down with a damp cloth. The pigment coating has a great resistance to light and will not fade as rapidly as dyes that are often used to colour unfinished leathers, such as aniline leather. Please allow 13 cm clearance from the wall at the back to allow full recline and a minimum of around 80cm between rows of seats. Recline extends around 58cm in front when fully flat. Assembly required: Seats packed separate, backs need slotting into position. Please add Platinum delivery if you require assembly. One power source required per 2 seats. We recommend an extension placed under the row of seats where there is space to conceal the plugs. Please retain packaging until entirely happy. Carton Sizes: 1 x 95 x 88 x 72cm - 1pcs. NB: The Snow White colour is a custom option. Request Samples: Brand reference: Monze - go to Monze ( Brand ) Leather Sampes page to order samples. Available to view at our showroom. Monze our specialist top quality, top grain leather recliner sofa range. Includes our fashionable home cinema seater. Competitively priced and highly sought out. Base foam upholstery with internal pocket springs and serpentine sprung and elastic webbed base. Foam and elastic webbed backs with fibre and foam filled back cushions. Solid wood (hardwood) frame. Plywood for non-structural parts and powder coated steel frame recliner. 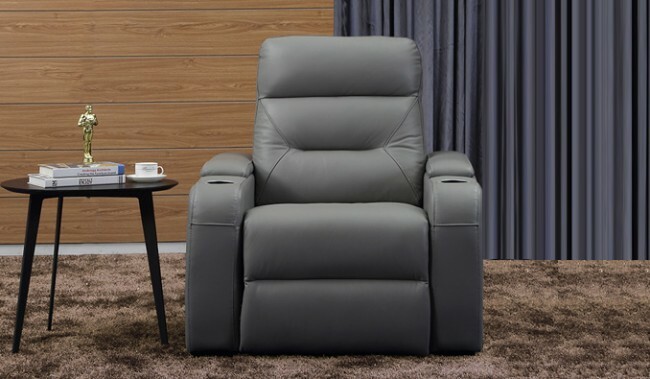 Manual or electric recline options available.